We will do our best to accommodate your busy schedule. Call us at 573-883-5665 to schedule an appointment today! Call or send an email today! Our staff will respond as soon as possible. Call us at 573-883-5665 today. Welcome to Ste. Genevieve Vision Care in Ste. Genevieve, MO. Drs. Clint Wolk, Courtney Kwan, and Kaitlyn Lukefahr, and the Ste. Genevieve Vision Care team strive to provide the finest in optometry services. Our patients are our family and our doctors and team want to provide you with personalized, one-on-one care and consultation through every step of your time in our office. Our doctors are happy to answer all of your questions about your eye health and vision and our staff are experts at coordinating your insurance benefits and helping you understand every aspect of your appointment. We invite you to browse our website to learn more about our practice and services. For a complete list of our services or to join our patient family and schedule an appointment, call us at 573-883-5665! "You guys have the most amazing customer [service].... Very helpful and always smiling....I drive from cape county because of your amazing service....I love the text ability as well life gets busy and that helps a lot!!!!" "The staff was very professional and courteous. They met my needs and the atmosphere was very pleasant. 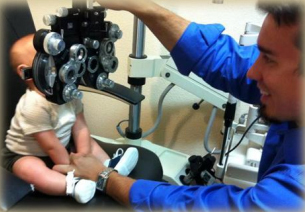 I have no issues going to this location to get my vision needs met." Dr. Wolk is a life-long resident of Ste. Genevieve. He graduated salutatorian in 2000 from Ste. Genevieve High School where he was also captain of the football and wrestling teams. Dr. Kwan has always called Ste. Genevieve home and was excited to return here to practice. She graduated from Ste. Genevieve High School as salutatorian in 2006. Dr. Lukefahr is a Ste. Genevieve native and happy to have returned home to practice optometry. She is a 2010 graduate of Valle Catholic High School were she was a member of the Volleyball team, Track & Field team, and the National Honor Society.